Welcome to the latest weekly fashion post. Each Wednesday, I try to inspire you with outfit ideas. I share what I'm wearing right now, how I put the outfit together and ideas for how you can change it up and make it your own. That's what getting dressed is really about each day, our visual presentation to the world. This week, we're going to make it sparkle. While I may love to look at bright, beautiful and sparkly things, I'm not really a fan of wearing them (unless they are diamonds of course!). Your outfit should not reflect light, blink, or cause the area where you're standing to appear lighter. But a little wink of sparkle, is a great accessory. Last week to a festive girls' lunch, I wore a simple grey sweater that happened to have silver threading in it's design. It was a subtle sparkly, and no one probably noticed until we stepped outside the restaurant. I paired it with a simple black skirt, tights and tall boots. 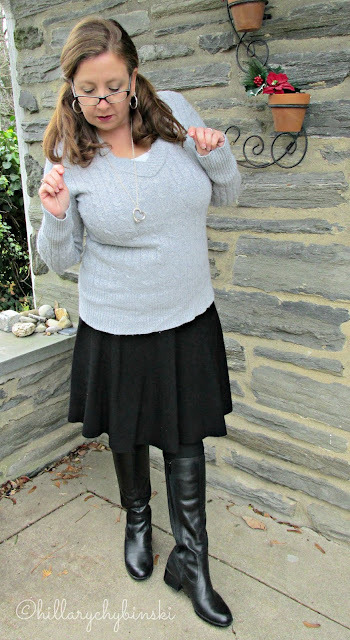 The sweater was the star of this outfit. I pulled my hair into two, loose pony tails . . .a real change form my usual hair, but the outfit "needed something" and my hair wasn't looking good down that day. To head out, I added my red plaid Kate Spade bag, and blanket scarf. Looking to add your own sparkle? If you want to wear sequins, try a simple sequin T-shirt with slim black pants or even dark denim (a white or grey would look fab!). Of if your bottom half is your better half, pair a sequin skirt with a cashmere sweater, t-shirt or even a chambray shirt. With strappy heels, you'll look all dressed up for sure! Sequins not really your thing? There are plenty of subtly-sparkly options out there. Look for sweaters with a glittery thread, pants with a shine to them, or shoes and bags that shimmer. Just promise me, you will keep the sparkle to one spectacular piece. How will you shine this season? Happy Holidays and shine on! 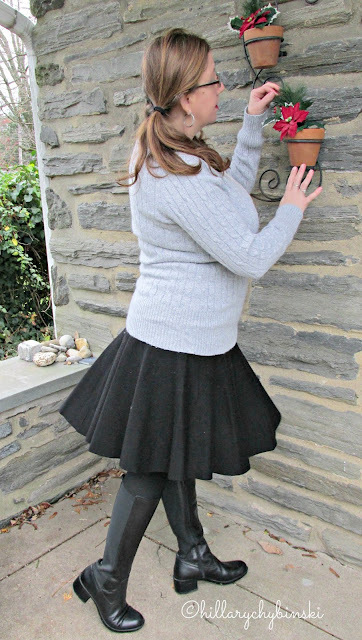 This post is linked up to The Pleated Poppy - be sure to check it out for even more outfit ideas and inspiration.